Steven L. Davis is the co-author, with Bill Minutaglio, of the new book Dallas 1963. 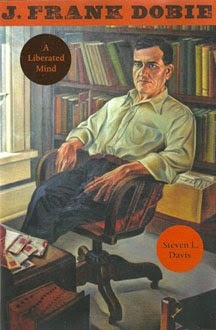 His previous books include Texas Literary Outlaws and J. Frank Dobie: A Liberated Mind. He is a curator at the Wittliff Collections at Texas State University in San Marcos, and he lives in New Braunfels, Texas. Q: Why did you and Bill Minutaglio decide to focus on the role of Dallas itself in the assassination of John F. Kennedy? A: We knew that Dallas’s central role in Kennedy’s death has become a lost history in recent decades, thanks to all the dust kicked up by conspiracy theorists. For every claim that JFK was killed by Lyndon Johnson, Fidel Castro, the Mafia, rogue CIA agents, or extraterrestrials, less attention is focused on a sobering historical reality: in the immediate aftermath of JFK’s death, most Americans blamed Dallas, Texas, for the president’s murder. And let's not forget that even before JFK visited Dallas, many of his friends and advisers were warning him to avoid the city on his trip to Texas. And when JFK was preparing to leave for Dallas the morning of November 22 he told Jackie, "We're heading into nut country today." Why did people warn JFK to avoid Dallas? Why did he call it "nut country?" And why did America blame Dallas? Those are the questions Bill and I set out to answer in Dallas 1963. To the lasting shame of Dallas, the people who whipped up this anti-Kennedy hatred were not fringe groups on the margins of society. Instead, they were Dallas’s leading citizens. These are people who have largely been lost to history, but were extremely important at the time. This roiling, supercharged environment was singular in America, and we felt it was worth examining in order to provide the context for Kennedy's death in Dallas. Q: Fifty years later, what is your sense of how the city of Dallas is perceived in connection with the assassination? 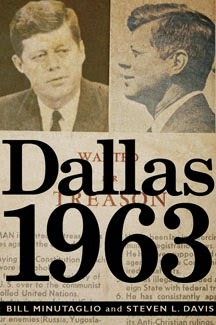 A: Dallas remains known worldwide as the place that killed Kennedy. The city has struggled for generations to come to terms with that reality. The Kennedy killing is Dallas's original sin. In a way, as our book shows, Dallas unfortunately turned out to be the one city in America most primed to cause Kennedy's death. In recent years, Dallas has changed quite a bit. The city elected an African American mayor and it has become one of the most progressive cities in Texas along with Austin. But the dirty little secret about Dallas is that the area itself is still very conservative--it's just that most of the conservative people have moved out to the northern suburbs. When Barack Obama visited Dallas early in his presidency he was greeted by the same signs that were waved at Kennedy-- Obama was denounced as a socialist, as a traitor. The big difference now is that the virus of hatred that began in Dallas has now gone nationwide. I can say that the single best step Dallas took to come to terms with the Kennedy assassination is to finally, after much debate, agree to preserve the building where Lee Harvey Oswald had worked and fired his shots at the president. Many people had wanted to demolish the building, to destroy the memory of what happened there. But now that building is home to an excellent, world-class museum, the Sixth Floor Museum. It provides a clear eyed and dignified homage to John F. Kennedy and his tragic visit to Dallas. The healing in Dallas begins at the Sixth Floor Museum. Q: How did you conduct your research, and how were you able to recreate what was happening during the 1960-63 period in the lives of such a large cast of characters? A: Our book is built on archival research. We were so fortunate that many of the principals in our story left their papers at libraries and universities. We were able to go in and read firsthand accounts of what was happening during these key moments in Dallas, how strategies for attacking JFK were formulated, how people were working together. In many cases, we were the first people to examine the papers, and we were continually astounded by what we found: letters, reports, affidavits, secret tape recordings, information passed along by political spies, interviews, etc. Amazing stuff. We also made use of the national archives, the FBI files, and presidential libraries-- all of which were extremely helpful. Q: How did you and Bill Minutaglio divide up the work on the book? A: It just sort of happened organically. We each had areas that we were more interested in, had more expertise in. 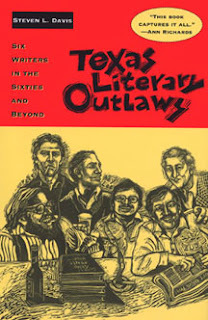 Bill, for example, is one of the great experts on civil rights struggles in Dallas, so he quite naturally took the lead on those stories. I concentrated on folks like General Walker and Stanley Marcus, but by the end we both had visited many of the archives and we each were very comfortable revising each other's work. By the end of the project we couldn't even tell any longer who had written what. It had become a blend. I won't say it was easy to reach that point-- we went through a difficult period in the middle of the project when we were still learning about each other, still trying to find a single vision for two different minds. But once it came together, our trust in each other became total, and the working relationship became golden from that point on. And still is. A: We're hoping to do another book together--and are putting the finishing touches on a proposal right now. But it's still premature to talk about at this point.